Historically, Older Americans Month has been a time to acknowledge the contributions of past and current older persons to our country, in particular those who defended our country. Every President since Kennedy has issued a formal proclamation during or before the month of May asking that the entire nation pay tribute in some way to older persons in their communities. Older Americans Month is celebrated across the country through ceremonies, events, fairs, and other such activities. The Older Americans Act (OAA) is a critical piece of legislation that helps older adults stay as independent as possible as they age. The OAA helps fund senior nutrition programs, caregiver support, employment training, elder abuse prevention, and more. Learn more by reading our Diverse Elders and the Older Americans Act Fact Sheet. How was I not aware of this?!? What’s being done about it??? 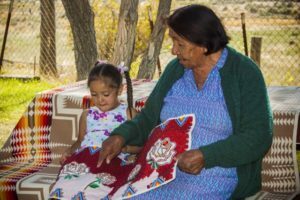 NICOA focuses on educating people on many of the issues our American Indian and Alaska Native Elders face. So please continue to support us and learn more by visiting our website blog, Facebook, or Twitter. To get more information on these types of issue you can also visit the National Council on Aging. A great post to learn more about potential program cuts can be found at tinyurl.com/yaf92qr6.